This Map is inspired by the TV series Game of Thrones. It's my take on the main Castle of the Vale. In this siege you can either play as the defenders of the Vale or play as the Attacker, which is supposed to be the Lannister forces, trying to free Tyrion from his wrongful imprisonment. The castle is encircled by two nested rings, made of natural walls. 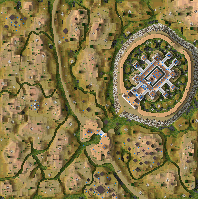 The attackers need to pass both the outer and the inner ring (of course, under constant fire) in order to just reach the castle walls. The long and well-defended approach is incompatible with the computer's offensive tactics. If you repel the initial attack, the computer begins to send swordsmen in small squads, which don't stand a chance to make it to the walls. This makes for boring and unchallenging defenses. I have not tried attacking the castle. I believe it is possible to take it with careful positioning of crossbowmen protected by mantlets, but it would be a similar exercise in patience. This castle belongs to the type that can be approached only from a single side, the rest of the perimeter made inaccessible using rocks or height drops. This trait of design leaves no choice to the attacker, limiting him to a head-on attack. Beautifully designed terrain with lots of detail. The castle looks beautiful as well, with a symmetrical plan and several levels of walls. The story apparently comes straight from Game of Thrones. Definitely not bad, but nothing special either.